Some of you might have noticed a big change. A revamped pet photography website, and a new domain name. My pet photography website was previously a second installation on my main working domain, based on WordPress. In fact I’ve been a WordPress user for over a decade (and I still am, in terms of my portrait website). But that’s gradually changing, and one of my two websites now has a completely new identity. When I first started blogging WordPress provided a fantastic solution. Back in the day was fairly easy to use, it was stable and reliable. As the years have rolled on the popularity of WordPress increased hugely, with the platform powering something like 35% of the world’s website. Including some very big names. Because of that, and because of the way WordPress is structured, it’s become a magnet for hackers. WordPress also relies on plug-ins for its features and functionality. Plug-ins have to be kept up-to-date for a number of reasons. If they’re not correctly maintained, hackers are able to find a way in. Another problem with plug-ins is that they can conflict with each other. Sometimes something as simple as a plug-in upgrade can break your site. A few years ago we were updating plug-ins every few months. Now it’s every day or two (and I only have five plug-ins installed). Not every plug-in will play nicely with any other plug-in. Not every plug-in will play nicely with your WordPress theme. When you carry out a PHP upgrade you may find that some of your plug-ins don’t support that version of PHP. The result is a hot mess - leading to one technical meltdown after another. This means you have to stop whatever you’re doing for however many hours it takes to get your website up and running again. The vast majority of sole traders have to have those skills - finding a developer, waiting for them to do the work, and then paying their fees simply is not an option. Last year I was spending several hours a week just trying to maintain and manage my WordPress installations. It became stressful, tiring, miserable in fact. I then suffered a major website hack - one of the dreaded pharma hacks. I couldn’t see the problem at my end, but my users were seeing unpleasant links inserted into my posts and pages. This is a difficult hack to clean up and I had to call in an expert in the USA. My site was cleaned and restored, but it had a profound effect on how I felt about my website. I felt that I had maintained my site diligently, and we never fully got to the bottom of how the hacker found a way in. I can only think that I’d been a little slow (perhaps by only a few days) in upgrading a plug-in, or it could have been previous theme files which I had kept as backups on my server. Another problem (and this is a big one) was the fact that both my WordPress installations were running very slowly and were returning regular 500 Internal Server Errors. I kept raising this with my then host (TSO) who would blame some aspect of my sites’ configuration. They would say the problem had been solved when it hadn’t. I started to lose my page ranking, the number of website hits per day began to fall, and business in general slowed down. I was at my wits end trying to figure out why these problems kept happening - particularly as my host kept telling me it was nothing to do with them. I subsequently discovered it was in fact problems at the hosting end - old and overcrowded servers and not enough staff to deal with the volume of customers. This is a really important feature of WordPress - your site’s performance utterly depends upon the quality of your hosting. In other words, if you run a WordPress site there’s no ‘support department’ to turn to. You are it. Think your WordPress site will never get hacked? Think again. Do you expect you’ll never have to learn any code? Wrong. Believe you’ll never have to spend good money on a developer? In your dreams. Given the glitches and problems I just described, surely it was just a case of finding another host? Well even that wasn’t simple. By this time my websites had been running for a lot of years and the blogs were big. In fact I think my site (including the two WordPress installations) was close to 12 Gig in size. Most web hosts will limit your size allocation, at which point you’ll have to jump up to the next level of hosting which can be costly. My site often received a large number of page visits per day - and I discovered that a lot of web hosts allocate a limited number of visits per month. And if you exceeded that number due to a spike in traffic, your website would become unavailable until the next calendar month. In fact that was the reason I didn’t run with an otherwise well-regarded WordPress host called Siteground. Eventually I did find an excellent host here in the UK, called Guru. They really are fantastic. But I still felt uneasy about staying with WordPress simply because my experience had been soured. What if my new host was taken over by another company and the service declined (as with TSO)? What if I had some unexpected problems with my site and had to spend another chunk of cash getting it sorted? What if I was away from my office for a few days and the site needed some urgent maintenance? In short, it all became too horrible. Another thing worth mentioning is that the theme I was using to power my WordPress site was Prophoto 5 (which I’ve had for about 6 years). This is an excellent theme and the people over at Prophoto are a fantastic bunch. But these days Google is favouring responsive designs which expand to cover all devices, from large high-resolution displays down to smart phones. A website which looks good on a smart phone is going to do better than one which doesn’t. Looking at my website visitor statistics, a very high proportion of my audience are browsing on a small device. So even if I had stayed with WordPress I would need to install a new and very different theme (such as Prophoto 7) and then get it to work with my content. This would mean a full redesign, I would also have to replace all of my images with larger versions. Given the amount of work involved, switching to a new platform made more sense. There is something liberating about a fresh start. Old content can be trimmed away. Existing content can be rewritten or improved. Sloppy SEO can be re-addressed on each page as it’s being built on the new platform. You can even rebrand in the process - something everyone should consider every few years in my view. What are the steps in choosing a new website platform? My next dilemma involved deciding where to go from WordPress. There are so many choices, such as Wix, Weebly, Squarespace, Zenfolio, Smugmug. How on earth do you figure out which one to choose? This is where you absolutely have to understand your present and future needs, because that will dictate which platform is right for you. I knew immediately that Zenfolio and Smugmug wouldn’t be the right choice - the customisation was limited and I don’t sell digital downloads, so I’d be paying for functionality I wouldn’t need. You may have noticed something which these providers all have in common. They’re fully contained all in one platforms, unlike WordPress. That means that your site software provider deals with your hosting, server maintenance, security, software upgrades, and they sort out any associated problems. All you have to do is design and build your site and concentrate on your content. Sounds good to me. I took a look at Wix because I’ve seen some really nice sites on that platform. After playing around with the backend, I thought it was easy and fun to use, but I couldn’t quite get the layouts to be as slick as I wanted. And since my website is very big, the better stocked Wix blogs I researched felt quite slow to load. Page loading speeds are important in terms of page ranking - Google doesn’t like slow websites. Weebly looked pretty good as well, but didn’t give me the design clout or growth factor I would probably need. This brought me to Squarespace. At first their templates appeared clinical and overly minimal. Beautiful, but a bit standoffish. I felt scruffy just looking at them. That isn’t a problem though, because if you’re building a great looking site you’re not going to be slinging your content into a ready-made template. You’re going to design your site to do what you want, rather than try to shoehorn it into something else. And that’s the route I went down - I stripped out the template and built my Squarespace site from the ground up. 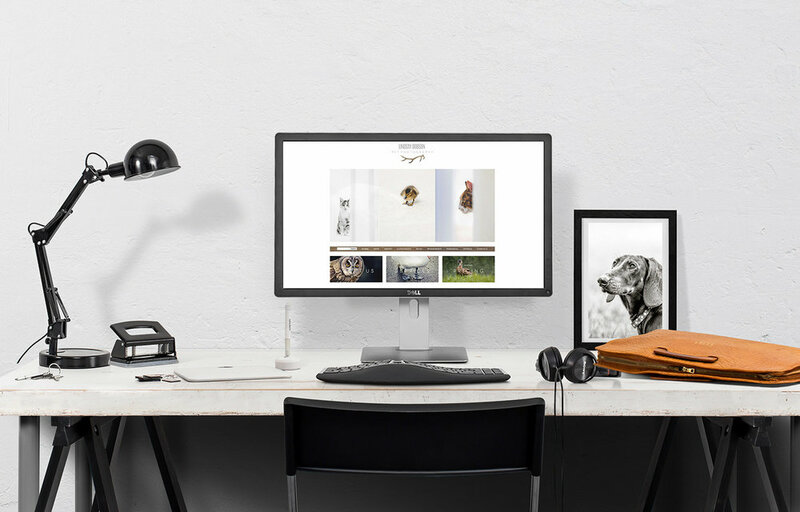 Squarespace is known for powering some of the slickest, trendiest, celebrity infused websites on the Internet. That’s a pretty good recommendation. But it isn’t without some caveats. So what are the cons of using a fully contained website system such as Wix, Weebly, Squarespace etc? The fact that you aren’t in control of everything is the obvious difference to WordPress. You can’t simply migrate to another host if you don’t like something, or if the service declines. Nor can you make your own backups or export content in a coherent state - that’s because you’re using proprietary software instead of open source software. Nor can you roll back to an earlier state if you make a complete hash of some design changes. In other words you have to give up a lot of control. But that was in fact the whole point of choosing a self-contained system in the first place - to avoid all that horrible endless maintenance and the misery of trying to sort out problems when they arise. A key feature of WordPress is that you can add all kinds of functionality with plug-ins. For example, I could create a subscriber list in WordPress so that my readers always got a notification when I created a new blog post. In Squarespace I would have to upgrade to a higher plan in order to get that functionality. Likewise if I wanted e-commerce capability. Wix is similar (but nowhere near as comprehensive or polished) in that you can purchase additional functions (via the ‘app market’). But as I said earlier, WordPress plug-ins require constant maintenance and they can be a pain at times. When adding content to my WordPress website, it automatically saves my changes as I go along. In Squarespace the software sometimes has the odd glitch and whatever work you’ve done since you last manually saved is lost. Manually saving also brings you out of the SS editor, then you have to go back in to continue working. Squarespace seems fairly fast, but it isn’t as fast as the most powerful Wordpress hosts. I’ve noticed that on some days my SS site is very fast indeed and on other occasions the images (although nicely optimised and sized) take a few seconds to load. On a couple of occasions they haven’t loaded at all and there has simply been white space - this is likely to be a browser issue and so far that problem has been confined to Edge. Aside from the response times from their support desk which are not within the two hours stated on the review sites. The last couple of times I’ve made contact with Squarespace Support the response has been better - within a day. The replies have been helpful, which is reassuring. Overall, I’m pleased so far. Another thing which became obvious to me when I started building my Squarespace site is the fact that the stunning SS sites I’ve been admiring had been custom-built by expert designers. And they were stuffed with custom code. As I’m not much of a coder, I had to build my site from the base framework. It’s also worth pointing out that if you change the code, or have anyone else do it for you, then Squarespace support won’t help you if you have a problem with that part of your site (understandably). You’ll be reliant on whoever built your site or supplied the code. I think it’s fair to say that all website platforms have their own benefits and disadvantages. It’s a question of weighing up your own needs and if the disadvantages will be in any way problematic to you. These things are never perfect, websites are sent to tax us (often to the point of distraction). Sometimes we have to just bite the bullet and try something. I have fellow photographer friends who have gone back and forth between platforms with regularity, before determining which one was the lesser of two or three evils. This is easy enough if your site is fairly small, but it’s a huge undertaking if your blog has more than a few dozen posts. It’s taken me over three months to put this site together, given all of the steps I’ve listed in this post. And that’s putting in a lot of hours each day (and night) mostly on the preparation. One thing I really must commend Squarespace for is the quality of their support documentation. The help pages cover absolutely every aspect of building and designing your website. These are incredibly well written and so easy to understand. There is a user forum as well, but this tends to be quiet. There are however a lot of very experienced Squarespace users out there. A Google search will generally yield some very good answers. One site I found to be particularly helpful is that of web designer Paige Brunton. I was struggling to decide which Squarespace template would give me the functionality I needed and Paige has a fantastic guide on her blog (along with a lot of other very helpful stuff). My next (and bigger) challenge lies with moving my portrait site from its current WordPress framework. There are nearly 600 blog posts on that one. Another ‘con’ of changing platforms is whether you can import your content to your new website. This really isn’t a simple as it may seem. Between Wordpress and SS you can import the first 200MB, but you’ll still have to re-format it and sort out your images which probably won’t copy over. That’s equivalent to about 20 blog posts. Hardly worth bothering. The long and short of it is that you’re mostly faced with importing your content manually. This isn’t a problem with Squarespace, it applies to virtually any change of provider. To make this task easier it’s worth trimming down any blog posts which are old and have no value. I cut this site down to around a third of its original content. The posts I removed received very little traffic and have very few links around the web, so it won’t do me any harm to get rid of them. This is a good thing to do in fact if you have old posts which are similar to other newer blog posts. Google likes unique content, so it can make sense to get rid of some old blog entries and redirect them to a more valuable, up to date and concise version.